St Albert of Vercelli, an Italian canon regular, became prior of his monastery of Holy Cross at Mortara (Pavia) in 1180, then rapidly ascended the Church hierarchy; created bishop of Bobbio in 1184, he was translated to Vercelli a year later. As such he gained experience both of high politics - conducting the negotiations between Friedrich Barbarossa and Pope Clement III - and of internal reform in the Church and Christian society, creating the rule for the Humiliati of Milan. He was one of a group of Italian prelates sent to the Crusader States by Innocent III to restore the Church after the crisis of Saladin's conquest. As patriarch of Jerusalem and papal legate to the Holy Land, he provided a simple formula for living (at 11,000 words, a fraction of the length of Benedict's Rule), a rule for a group of hermits who had been living a life of penitence at wadi ʿain as-Siah on the southern slopes of Mt Carmel. He was assassinated in September 1214 by the Master of the Hospital of Holy Spirit in Acre, during the procession on the feast of the Exaltation of the Holy Cross. Albert's formula was approved by Pope Honorius III in 1226, then revised by Innocent IV in 1247 in order to relax Albert's stipulation on stability, and thereby to permit the hermits to leave Mt Carmel, settle in other places and adopt a mendicant way of life. This new volume of essays on the Carmelite Rule and its influence grew out of two commemorative events: a study day at the International Medieval Congress at Leeds in 2007 to mark the seventh centenary of St Albert's Rule for the Carmelite Order, and the eighth centenary of Albert's death in 2014, which was marked by a conference held by the Order in Rome. 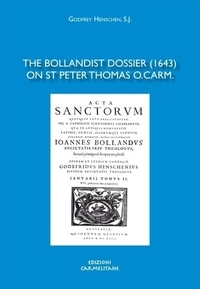 The volume is divided into two parts: the first, 'Devotion and the Rule', containing five essays on general questions of the Rule in its context and the nature of the early Carmelite community; the second, 'Orthodoxy and Dissent in England', comprising a further five essays on aspects of English Carmelite textual composition, translation and visual culture in the later Middle Ages. Four of the essays are by professed Carmelites, the others by a mixture of younger and established scholars. For reasons of space it is not possible to provide a complete analysis of the whole volume. As with most collections of this nature, it offers a mix of essays that are essentially learned paraphrases of existing literature and genuinely new research. 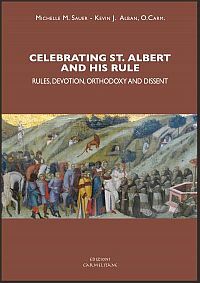 The first part of the volume, dealing with the nature of the Rule, reveals the divergence of views on Albert's achievement. Patrick Mullins' essay 'The Carmelite Rule: Text and Authors' concludes that Albert's formula of the first decade of the thirteenth century (1207 is a date of convenience) was personal to him, not drawn from any specific previous document, though conceding that Albert was probably influenced by existing rules. In contrast, Patrick Thomas McMahon's rather rambling 'The Hermit Community on Mt Carmel, c.1207 CE' argues that not all of the Rule can be attributed to Albert, that the propositum mentioned in the preface to the Rule was a separate, previously written document; moreover, following Craig Morrison, that it is possible to identify those parts of the Rule that were Albert's by his 'fingerprint' in certain chapters on stylistic grounds. Markus Schürer, 'Monks, Mendicants or Hermits? Who were the medieval Carmelites?' discusses the shift in Carmelite identity necessitated by the revised Rule of 1247. In a characteristically perceptive contribution, Paul Chandler examines the difference between typological and historical continuity in the Carmelites' Elianic tradition. His explanation of how Carmelite '[R]everse engineering historicized typology' is particularly thought-provoking, as is his discussion of why the hermits of Mt Carmel wanted a Rule in the first place, given that far from all such groups expressed such a desire. It is the second half of the volume that shows new directions in research. Michelle Sauer's excellent essay on Lambeth Palace MS 192, reveals the translation by the fifteenth-century English Carmelite Thomas Scrope of the so-called 'Rule of St Linus', a document spuriously attributed to the second pope that shares much in common with the Rule of Albert. Who was it for? Maybe, suggests Sauer, a Carmelite choosing to live a more challenging life away from his community? The emphasis in the text is on personal prayer and meditation, but, unusually for a text of this date, there is little about the spiritual value of works of charity. This manuscript, which also contains Felipe Ribot's De institutione, was once owned by the Norfolk Carmelite - later Protestant bishop - John Bale, and it is fascinating to speculate on his interest in this collection. 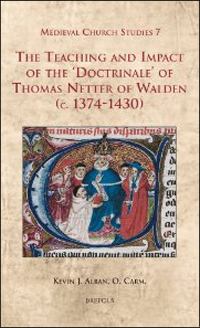 Kevin Alban's essay, 'Fighting Lollardy with the Rule: Netter and the Doctrinale' shows in authoritative fashion how the supreme Carmelite theologian of his day used both Albert's Rule and Carmelite ecclesiology to combat the arguments of Wyclif and the Lollards. In the only essay in the volume on visual culture, Valerie Edden returns to a manuscript to the interpretation of which she has already made a major contribution, the 'Reconstructed Carmelite missal' of the fifteenth century, and shows how the images in the missal make public pronouncements about Carmelite understanding of their profession and their faith; e.g. belief in the doctrine of the Immaculate Conception, but also comment on their devotion to the Blessed Virgin and St John the Baptist. Naoe Yoshikawa's essay on Margery Kempe shows how Margery's knowledge of Scripture and of certain devotional traditions was derived from her spiritual formation by the Carmelites of Lynn. More interesting, if more speculative, is her suggestion of Ribot's influence on Margery's stages of spiritual growth, and especially on her personal identification with the Blessed Virgin. Tamas Karath examines in detail the translation of Richard Rolle's mystical works by the Carmelite Richard Misyn. The translation has been criticised for slavish adherence to the original but Karath argues persuasively that in his treatment of figurative tropes and in his reinterpretation of the vocabulary of physical experience of God's presence one can see his editorial choices. Finally, William Rogers' discussion of the Concordia, a poem by Richard Maidstone, the Carmelite confessor of John of Gaunt, shows how the Order's ideals of penance and poverty were transmitted through an imaginative literary reworking of the Psalms. In all, the second half of this volume showcases the creativity and imagination of the English Carmelite province in the later Middle Ages. The volume as a whole is a welcome addition to Carmelite scholarship.